It was 8 in the morning last Saturday in Kent, Connecticut, a pastoral, peaceful place. I was about a mile from a private school on a quiet street that ran parallel to the Appalachian Trail. My instructions were to park behind a black Mustang and head toward a make-up tent, where I would be transformed into a zombie for the day. I and about 20 others were responding to a call for extras. Extra zombies, that is. Scared Stiff is the name of the Web-based horror series production company and was filming an installment called “The Battery.” From what we got from the sound guy, as we lined up our cars and stood rather uncomfortably together on the side of the road swatting flies, it was about a couple of ex-baseball players who find themselves in the middle of a zombie post-apocolypse and are struggling to find a small outpost of the living. Slow chases ensue. We were a little short on zombies by about 11:30, and I was still waiting in line. All of a sudden this 11 and 7 year-old brother and sister team came barreling in and demanded make-up. They got it, along with plenty of other attention as they rifled through the make-up, borrowed mirrors, and basically asked 4,000 questions. I think they ate up a little too much time because by the time I had my chance, all I received were some dark circles under my eyes and greenish skin. 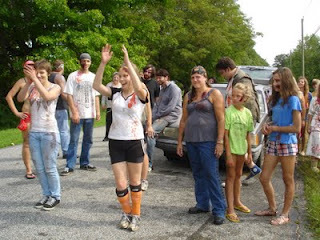 While we waited, it became apparent that members of the extra cast were much more well-versed in zombie culture than I. Lines from “Day of the Dead,” “Dawn of the Dead,” “Shaun of the Dead,” “28 Days Later,” and “Zombieland” were the lingua franca for this crowd and I could only marvel at their knowledge of man-to-woman survival ratios, stumble patterns, and even the history of zombie mating rituals. The scenes we were assigned to were standard zombie attacks, as in very slow and very ineffectual. We shook a Volvo for one scene, tried to enter the Volvo in another, and wandered en masse down the road toward the main character. The array of zombies were impressive. There was life guard zombie, biker zombie, society lady zombie (with bloody pearls), field hockey zombie and flight attendent zombie. 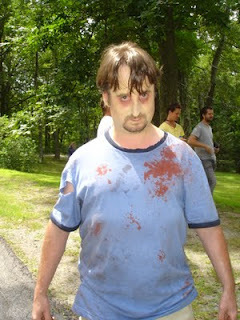 I was hiker zombie, because that was just the costume I had with me. Overall, the eight-hour experience left me tired and sunburned, but grateful for the chance to travel briefly in the world of the undead. If the film ever actually finds release, perhaps on the festival circuit, I’ll be sure to share that information with the world. 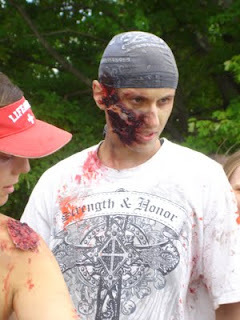 This entry was posted in Nonfiction and tagged zombies. Bookmark the permalink.